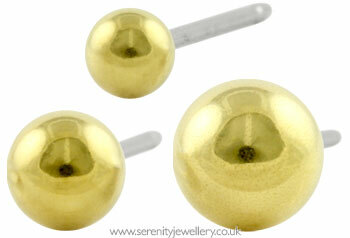 Hypoallergenic Blomdahl golden titanium 5mm ball stud earrings with titanium butterfly backs. I chose these thinking they would look classy but instead they just look brassy - literally! The colour of the studs does not replicate gold but looks like slightly tarnished brass and cheap. 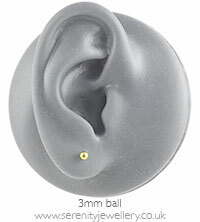 To be really honest, if I had the chance again, I would not repurchase these for that reason and would instead have just gone for a pair of the titanium coloured ball stud earrings that always look great and attract compliments. Really disappointed in these and would have returned them had I not been chided into wearing them thinking I would change my mind. Been several days now and still remain very unimpressed and as though I have wasted my money and kicking myself for not following through with my initial reaction. I have bought earrings from this site for several years and always been thrilled with the products and service and very sad to leave a bad review but these earrings just look cheap and unconvincing. Very pretty little earrings. I am so pleased to have found some that really are hypoallergic! MY 14 YEAR OLD DAUGHTER HAS VERY SENSITIVE SKIN, AND THESE STUDS HAVE NOT REACTED AT ALL. Easy to put on earrings with a thin post. Good for sensitive or recently peirced ears. The gold coating is quite thin so they are not as golden and not as shiny. I would recommend for everyday. Just what I wanted, it\'d be useful to be able to buy individually too, as I always seem to be losing one and can\'t always buy another exactly the same. I was very pleased with these earrings, and the packaging was elegant and understated - just right for the person I was buying them for. Delivery was quick too. An excellent product and very good service. Since receiving these have worn them pretty much all the time. I am so pleased to be able to wear gold earrings which do not cause any irritation. Serenity have come up trumps once again. Love these earrings. It's a light gold colour and look very pretty. I wear them pretty much all the time.